Saginaw Bay walleye fishing off Linwood was centered around the Black Hole and 1 to 2 miles northeast of Spoils Island when boats could get out there. Body baits off planer boards was the ticket, although some boats were vertical jigging near Spoils Island. On the east side of the bay from Quanicassee to Bay Port, walleye anglers were fishing all over the bay but no one had great success as most boats came in with only 2 or 3 fish. Spring perch fishing is pretty much over. Walleye anglers are also catching and releasing a few smallmouth bass. A few pike were caught in the Sebewaing River. Up at Caseville, pier anglers managed to catch some walleye, one coho and some smallmouth bass. Near Port Austin, those fishing the Pinnebog River caught suckers, pike, and smallmouth bass. A couple walleye were taken at the mouth of Bird Creek. Saginaw River boat anglers vertical jigging in the lower river were taking some walleye. Shore anglers at Smith Park caught mainly white bass, freshwater drum, catfish and a couple pike. Smallmouth bass were caught and released in the marinas. Tittabawassee River walleye fishing in the entire river from Dow Dam downstream to Green Point was excellent for the opener. 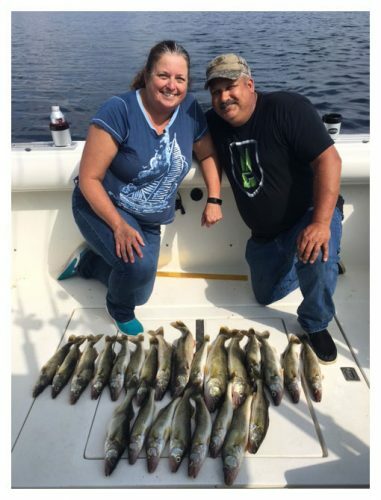 Limit catches of 5 fish per angler was common. Even the shore anglers did well when they could get to a deep hole or run. Ninety-five percent of the walleyes taken were males as the large females have moved back out to the bay. Au Gres Area those trolling for walleye did very well between Pointe Au Gres and Whitestone Point when trolling body baits off planer boards in 15 to 25 feet. Limit catches were common. Au Gres River down at Singing Bridge, surf anglers fishing late in the evening are catching quite a few walleye which seem to be feeding on gobies as they were full of them. A couple steelhead were also caught. Oscoda walleye and a few large lake trout were caught by those still-fishing minnows from the pier. Fish were also taken on jigs and soft plastics as well as deep diving crank baits and jerk baits. More fish were starting to show up in the evening. Strong winds have stirred up the lake so water clarity was poor. Au Sable River atlantic salmon were caught by those fishing the holes between Mill Street in Oscoda and the mouth. Drifting or still-fishing spawn bags and minnows took Atlantics up to 8.5 pounds, walleye and suckers. Pyramid sinkers in 2 ounces or higher were required in the current. Those trolling plugs also caught Atlantics. A few good walleye catches at Foote Dam for those casting jerk baits. Steelhead were taken when drifting wax worms, wigglers, beads, flies, and spawn bags. Both chrome and winter fish were caught but high water levels from an open gate at the dam had the fish scattered. Most steelhead were pre-spawn. The ice has thawed from the dam ponds and the waters are warming more quickly. 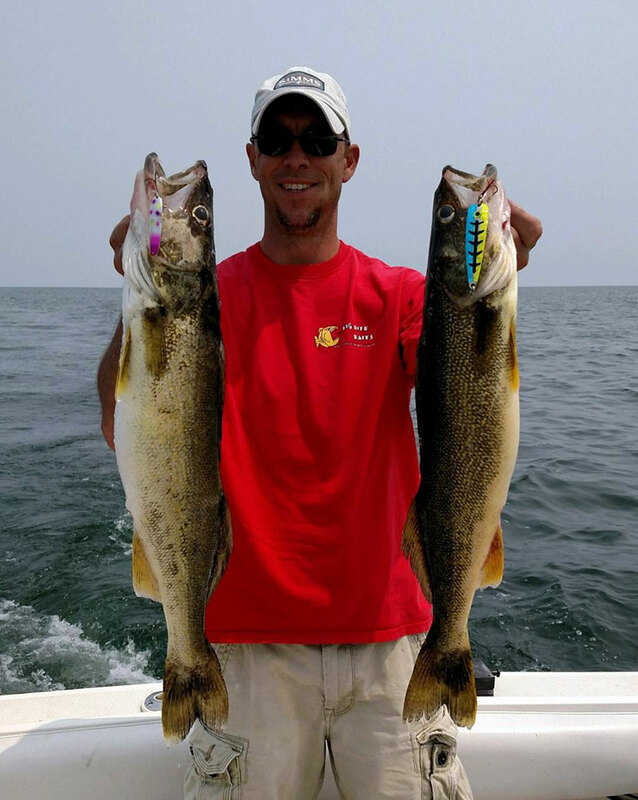 Tawas Area boats launching from the mouth of the river and fishing in Tawas Bay, down near Alabaster and off White Stone Point did well for walleye when trolling crank baits and body baits off planer boards in 15 to 25 feet. Some limits of 8 fish per angler were taken. Shore anglers caught walleye at the river mouth. A few pike and smallmouth bass were caught. Pier anglers caught a few walleye, Atlantics and steelhead when casting body baits and spoons or fishing minnows near the bottom. This past Saturday marked the opening of the inland walleye and northern pike seasons in the Lower Peninsula – will you be getting out soon to try your hand at northern pike fishing? Northern pike like to spend their time in the weedy shallows of both the Great Lakes and inland waters. In rivers they can be found around log jams or fallen timber. They are often taken with live bait (such as large minnows) or different kinds of artificial lures. When fishing for northern pike, many anglers like to use a six to eight-inch wire or steel leader directly in front of hook or lure. Pike have large, deep mouths with extremely sharp teeth. They are known to engulf the entire bait or lure and sever the fishing line with their teeth when it is attached directly to the hook or lure. This leaves the angler watching as the fish swims away with their offering. Want to learn even more about northern pike in Michigan? Check out their informational page online!